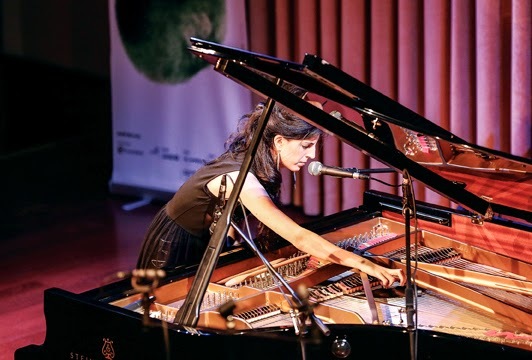 Last night's musical issue was London based Turkish pianist Ayşedeniz Gökçin's concert in Ankara Music Festival. 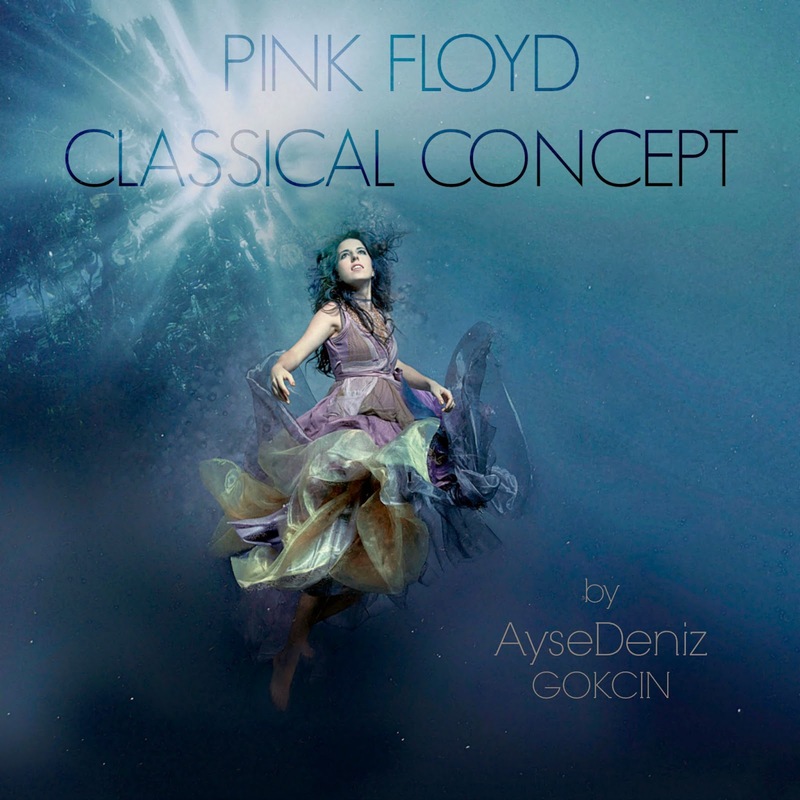 Titled as 'Pink Floyd Lisztified', the first part was dedicated to solo piano performance of arrangements made by Ayşedeniz Gökçin for some Pink Floyd's legendary progressive rock pieces. We have learned during the concert that most of these arrangements were made in 2011, which was 200th year of Liszt's birth. We have also noticed from the pianist's other small talks between performances that she is truly impressed by Liszt's adherence to the innovation and change. The album including the performances given in the concert is named as Pink Floyd Classical Concept. Let me also remind you that there was also a Chopin-influenced arrangement for "On The Turning Away" in the first part of the concert. As it is said again by Ayşedeniz, it was a great chance for the listeners to be able to compare two different styles of Chopin and Liszt. The solo piano partitions are accompanied by some sound designs and records which are previously performed by Ayşedeniz and processed by Canadian sound engineer Kevin Bryce. The introduction is made with "Welcome To The Machine" followed by "Set The Controls For The Heart". "Hey You", "Wish You Were Here", "Another Brick in the Wall", "Us and Them", "Comfortably Numb", "Shine on You Crazy Diamond" and "High Hopes" were the other Lisztified pieces of Pink Floyd. I can say that I like Ayşedeniz Gökçin's arrangements, which are accomplished by applying many different partitions of various instruments to the piano in an interesting way similar to what Liszt was doing for symphonies once upon a time. Especially the arrangements of "Shine on you Crazy Diamond" and "Wish You Were Here", which were travelling totally in another space than the original compositions, were really impressive. On the other hand, for some arrangements such as the one for "High Hopes", I have to say that they did not give the same tensional feeling for our ears, which are full of the original version's wonderful aura. In my opinion, the absence of tension and groove in this technically almost-perfect performance was a reason for this. I did not hear a dynamic range which is built up with soft and slow touches and can hit the audience in the end. Besides, the bad acoustic conditions of the hall that eliminate the mid-frequencies and present interesting ambiguities in high registers prevented me from following the performance in full concentration. This dry hall caused the sounds created by Ayşedeniz Gökçin with touches and strokes to the strings of the piano to decay so fast that the intented effects could not be achieved. I also thought that some unbalanced sound distribution on the stage especially in second part may be resulted from the sound board ridiculously located underneath the left speaker by the technician. The only thing I can say for the previously recorded sounds and their playbacks is that it would be better if these sounds were played on-the-fly by an individual musician, a DJ or a simple laptop user. After the intermission, second part is started and finished quickly by arrangements of Astor Piazzola. We listened to 5 arrangements: Tangota, Muerte del Angel, Fuga y Misterio, Libertango and Adios Nonino. The drummer Russ Webb was on the stage too. We again listened to sound designs (previously recorded and processed sounds). Frankly -even the audience liked it very much- I did not like this second part since the arrangements were not complicated and innovative enough, the tone and the overall sound of the drum set is very bad and the pre-recorded sounds were too mechanical and computerized. I think that the deep rhythms and the bpm-s chosen for the arrangements caused them to sound too simple. Maybe the fact that the piano stayed recessive compared to the other instruments had a contribution in this feeling of mine. The encore was after a long ovation and Ayşedeniz Gökçin played an arrangement for "Billie Jean" from Michael Jackson with Russ Webb. As a summary, Ayşedeniz Gökçin is a serious talent and an innovative musician. She has many fans and a remarkable audience on international stage. She evidently deserves these. I think, besides all these successful works, she can also present qualified performances for some improvisational jazz pieces (I am sure she has already done this).